I promise this to be my last running post for a while. Or maybe not. I am apt to change my mind often, being a flawed human being an all. You know, that thing. I ran my first ever marathon yesterday. Many folks have asked me how it went or how it felt, and even a day removed from it, I am still unsure how to answer. In many, many ways, it was fantastic. The weather was a bit chilly, the crowds were awesome, the route fairly flat and the organizers did a stand up job. It was just that pesky thing of running 26.2 miles. In one shot. 2) Don’t let the blind, obese man pass me. 3) Try and sneak in under five hours. I finished in 4:52:30. Long time to be running. A long time. Could have watched half of Dexter Season 2 in that time, or one-and-half Lord of the Rings movies. The winner had already been crowned, interviewed, whisked to his hotel, bathed, massaged and on the way to airport by the time I stumbled past the final time mat. 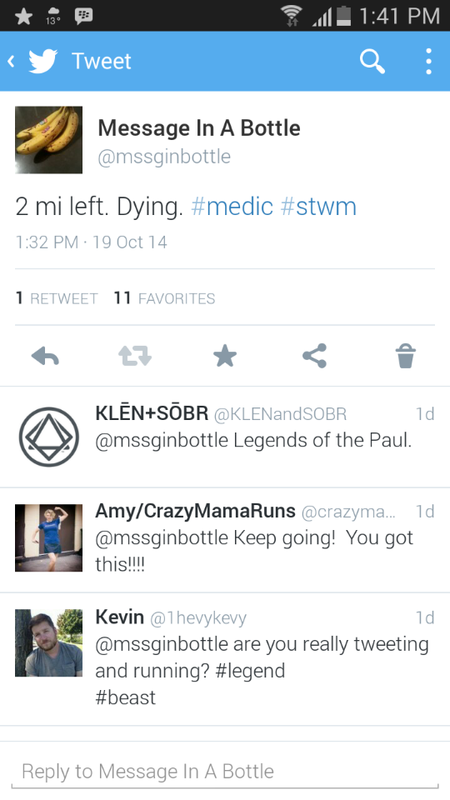 Now outside of the expected physical mutiny my body demonstrated, there was a lot going on in this race. 25,000 runners ran this year. It took about 15 minutes just to get us cattle out of the corrals and past the starting gate. And once it started, I found myself becoming more and more of a lunatic. Emotionally speaking, that is. Imagine grabbing the colours of most major emotions and smooshing them into a Play-Doh type pancake, where the hues bleed into one another and turn to a beige-y mess. That was me. I started at the gate with teary eyes. Thought of the sacrifices I and my family had made so that I could train and to be there. Ravaged my mind with some of the things that I had been when I was an active drinker. Thought of the things that have come to pass since. Felt the cold winds down University Ave. clearing my mind of negative feelings. Felt the presence of Now more than I had in a long time. There was a singularity of being one amongst many. And yet being part of and not apart from. A sort of paradox. I thought of my dad, whose cancer had come back. How I dedicated the race to him, he a runner himself for decades. Who had never run a marathon, but raced many other distances. I felt a calmness come over me and then settled in. I won’t go blow-by-blow about the run. It was hard. But I went through cycles of joy, sadness, gratitude, jealousy, envy and elation. I went through funks of ennui. I went to dark places of giving up, of ripping off my bib and taking a taxi back home. I went to the nooks and crannies of my old ways of thinking – negative, unfocused, comparing myself to others. Those thoughts would be offset by some “Holy crap I’m doing this” and the kind affections of the tens of thousands of people watching along the route. The little girl handing out cut up bananas. The old man standing on his own with bottles of his own water even though there were countless water stations. Funny hand made signs and several entertainment areas pumping out live music. But the most difficult journey was not on the pavement, but within. This was, for me, all about ego strippin’ and not ego trippin’. 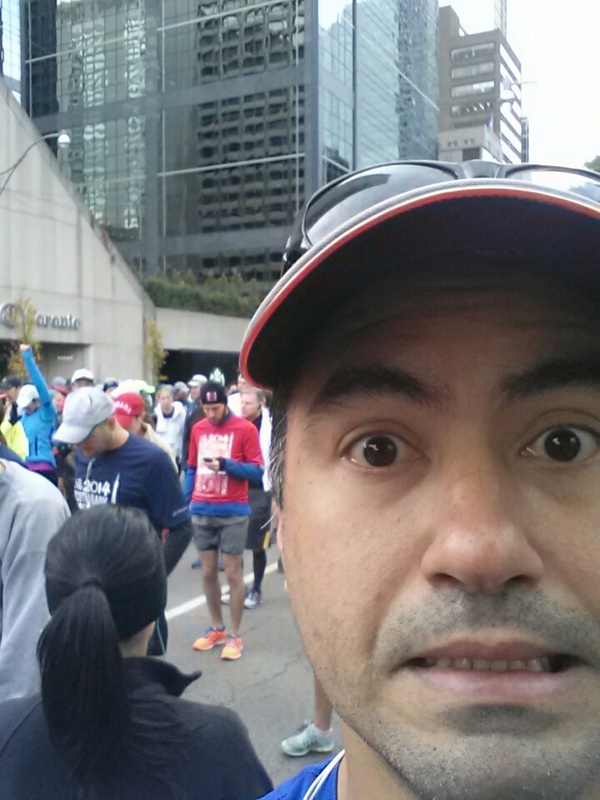 I found myself judging the looks of other runners at some points – hey that guy looks like a homeless dude. She’s overweight. He’s got a weird way of running. And these were people who were almost an HOUR ahead of me. How dare I judge! I caught myself and would chastise and even laugh to myself. I found myself struggling with those who I felt should be way behind me. Embarrassing to admit, but that’s my truth. I also found myself both in awe and in envy of the well-formed and well-honed runners that passed me going the other way. I didn’t know their stories, and so who was I to cast them in roles that they probably wouldn’t want to be cast in? Hero, egomaniac, princess. But I thought “perhaps one day, Pauly”. Perhaps. So here it comes up again – comparing myself. I saw people I know on social media just killing it out there. I found myself jealous of them, and yet, happy for them. It was a precarious balance. Near the end, as I struggled mightily to finish, I pictured myself not talking to anyone after the race. I pictured myself hiding under a rock. I pictured myself taking my ball and going home. I didn’t want to feel that perhaps I didn’t measure up in some way. This was where it got ugly for me. Never mind “Construction” – this was “Destruction”. Ugh. And that one of the reasons I drank. To cover up that feeling of not measuring up. To sabotage myself? “Hey – if you think I’m a screw up now, watch this.” type of thinking. I saw all of them – the happy, fast runners and then me. The bridge troll taking up the rear. I didn’t want to commiserate with them. I wanted to stay the lone wolf and recoup in my cave, resentful and wanting. But I realized that I had a choice. I could do that, be miserable and cut off from what little ties I had to the running community, or I could just take it as is. Get ego out of the way and let it be. Just be content in what I did and leave it at that. Ego – it always comes down to that for me. What did I expect? To run under four hours? To light the place on fire? Those runners I both admired and lightly vilified have trained very hard for many years. Some are naturals. Some are built for running. Period. To compare myself to them is folly. Old habit. I don’t win. I had to see that this wasn’t a challenge against anyone else except myself. I have a hard time with that still, but I am hanging my hat on that right now. Like recovery, this road had twists and turns, times where I wanted to give up, times where the wind was against me, times where others helped me along. But unlike recovery, this had a finish line. In recovery, we trudge the road of happy destiny. There is no finish line – the path is the destination. Just being on it and pushing through is a victory in many ways. And we keep at it, regardless of external and internal circumstances. My desperate tweet near the end. Yes, I had time to tweet. That’s how dead I was. Judge me. I decided to stay positive. I clapped back when people clapped encouragement. I encouraged others to keep going. I smiled at volunteers, thanked everyone I could and gave high fives. I chose to stay connected, when everything in me wanted to shrink back and play small and hollow. And this is still new to me. It was like watching another dude doing that. Sure I have my dreams. I would love to qualify for Boston one day (I would have to run over one-and-a-half hours quicker than my time yesterday). It could be two or three years from now, it could be ten years, it may never be in the cards for me. All I can do is my simple best – put forth a noble effort and leave the outcome to Creator. I am looking for a coach now and want to take it a bit more seriously. I liked my 42.2 kilometers of humble pie, in a strange way. Sloppy but satisfying. It had a cleansing tone to it. But in the end, I have to see it for what it is. I am doing my best within my means. Any sort of expectations only ramps up resentments. Today is a rest day. I am having a hard time sitting still, but doing my best to chill and stay in the moment. My mind is at some sort of rest too. I just found out that my dad’s cancer hasn’t reached his lungs, so we have that in our corner. There are still surgeries to be performed, but we know it will be alright. I ran a race. It was a new experience for me. But in the grand scheme of things, it’s not much compared to the journeys many other people are on right now. Like my dad’s. Or those still struggling with addiction. Perspective is a grand thing, ain’t it? P.S The only two people I ran into before the race were two guys – one is a champion runner and also an addict in recovery who I know from social media (and we plan to have coffee soon) and the other was one of my counsellors in treatment. Funny that they were the only two I met. Coincidence? Great job on the run. The symbolism is fantastic. But just as the physical pain can take over, the mind can bounce us back to a better place. Way to dig deep, finish and enjoy (??) doing so. That took guts and you did it. I guess the 5k my sil wants me to run with her this weekend isn’t such a big deal after all. Well done, Paul. thanks Linda – and I did enjoy it. I really did. The more distance I have from it, the more my perspective shifts ever so slightly. And that 5K? That’s a distance, my friend. A year ago I would have killed to run that distance in one go! Good luck with that run! 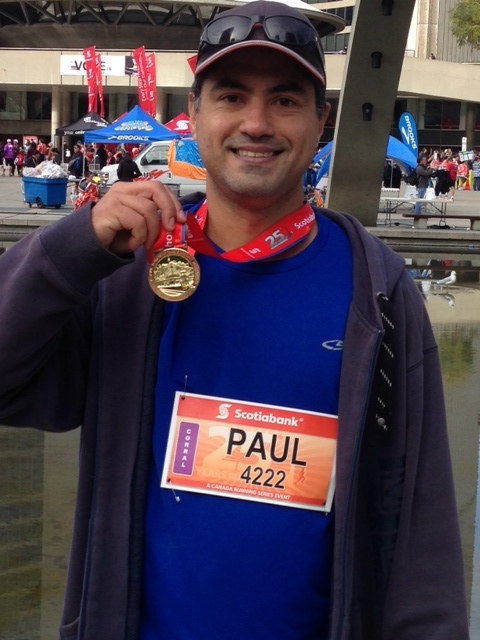 Congratulations Paul! All of that training, all of those months culminated in a fantastic run! Good for you! I am impressed, no matter what the time of the race is, you are still doing better than anyone sitting on their couch. Thank you SL…yeah, I kept my phone off the entire time. I was walking for about 2 min and wanted to take a pic. Then thought, what the hell, throw a tweet out while phone was on. Ha ha. Thanks Lucy! I could barely move a muscle…except my two thumbs…lol. Have you run lately? Did I know you ran – have we had that discussion ?? First – so happy to hear about your dad. He can beat this. I’ll be praying. Second, and I don’t know how to say this because I am CERTAINLY not a runner so please take it in the spirit in which it is intended. I am so proud of you!!!! Not just for completing the race but for the way you completed it. With a soul-searching purpose that is inspiring. You didn’t “just run”. You used this race and all the training that went into it to prepare not only your body and mind but your soul for this life altering event. You’re such an amazing man and I am proud to know you. Damn you Sherry for getting me emotional with that. Thank you. I know my dad will be fine. I can feel it. Thanks for the prayers. Glad to know you too, my friend. Blessed to have you as a friend. Congratulations Paul, that is one hell of an achievement! And sending my thoughts and prayers to your dad. Yeah you. Lots of thinking in that marathon. I guess that’s what just under 5 hours gives you. Motivating and inspiring. Thank you! Way to go, Paul! So happy for your accomplishment, but even more for your perspective and love how you broke down the wide range of emotions and thoughts you had. As for comparing, I would be happy to have your pace for an upcoming 10k, a mere fraction of a marathon. I’ve been at this awhile to know I’m not a natural runner, but find thrill in getting outside and doing it anyway. Perspective is such a blessing, indeed. The moments where I’ve lost it sound an awful lot like that destruction zone you described. I’m sorry to hear about your father, and hope he gets more of that promising news. thanks Kristen! I too am not a natural born runner. I just don’t think I have what it takes. And that’s okay. I just want to do the best I can, I suppose. The elites and very good runners looked like gazelles out there…lol. I watched a video (albeit a short one) of me running and I resemble a pregnant yak…ha ha. I laugh…why not? 10K is nothing to sneeze at. As I mentioned to Linda in an earlier comment – the “shorter” distances are ones that I would have killed to do when i started out. I couldn’t understand running 5 or 10K, let alone longer. I am actually thinking that perhaps I should run more 5 and 10K races. Easier on the body and I don’t use up a whole day for it!! And thanks for well wishes. My dad will be fine, methinks. I am not stressed about it, especially now that the cancer is contained. Congratulations on the race, what a wonderful accomplishment physically and emotionally. Thank you, J. And you are right, I have been able to find a bit more perspective on this for sure. it feels all balanced out now. I love the running, but it doesn’t demand all my attention. I do it when I do it. And then I move on. Ah to have had that balance in my life before! Was never a reality. I understand what you say about how you relate to the measuring up. We all do it in our ways, don’t we? I was even doing that with the fit(ter) bodies I saw during the race! You know what I mean. Wahooo! Welcome to the marathoner club! Congratulations!!! I totally got clocked by a blind runner too. Running a marathon is hard — it’s the mental aspect that is most difficult for me. It’s humbling but it also is much like the work of sobriety. As for coaches, I highly recommend McMillan Running. I use one of their coaches, and she’s helped me with more than just the physical training. Yay! I was hoping you would catch this post! And yes – it’s damn hard! The mental part has always been troubling for me, especially on my long runs, but I have been caught off guard on shorter or mid runs by the negative chatter in my head. Doesn’t matter if I have music on or whatever – my mind trumps it all. I run alone – no clubs, etc. so I wonder sometimes if running with others helps. I am gun shy when it comes to social scenes, and I don’t think I can talk while running! So we’ll see. As for the coach, I have had a few people (like you graciously) give me recommendations. I imagine a “live” coach, but it seems that many if not most coaches coach online. I am going to investigate further. I am no rush, and if the cost if prohibitive, I may just skip it. Frankly, I didn’t “train” as much as I just ran a lot. You know? No hill work, no intervals, etc. (I was worried about my Achilles acting up again). Anyway, thanks again for the response!! And yeah, I am going to update some of my bios – “marathoner”! Blessings and thank you. I always enjoy your kind words. Ha ha…thank you for that. Muchly appreciated. Sounds like the run was a good experience for you, you finished. Good show, and congrats. BTW what is your dad’s name so I can add him to my Church’s prayer list? Congratulations, Paul! What an accomplishment. And another thoughtful and beautiful post. That feeling of not measuring up? Oh, my, yes, I know that one. I can see it so clearly in just about everything I’ve done, my whole life. I am hoping that really working the Steps will heal me to the point that I only do it about 57% of the time. Working the steps first time around (and working them now again) showed me just how prevalent this character defect of mine has been. A big one. Still likes to pop up (Steps 6 and 7 come into play here for allowing me to be willing to be relieved of my shortcoming and humbly asking Him to remove them). Catching it early on helps me. Also getting deeper into why I feel I don’t measure up brings me more clarity. For me, fear of not measuring up gets into fear of not being seen, which gets into fear of being rejected, and the fear of rejection brings me the fear that I will somehow die. Dramatic, but there is in the end, ego’s fear of death which ultimately begets other fears. Pride is in the mix too – I don’t measure up so that means others won’t like me, or that I will be seen as weak, etc. Lots that plays into it for me. Letting go of the facades is my challenge and just accepting myself. Accepting me as God sees me and created me. When I judge His work, I am trying to play God myself…ya see? I think you may have inspired me to tackle a 26.2. Good job man, finisher (marathon) and a quitter (booze). Strong work!!! weird I was an amazing long distance runner…won a lot of races in my time. Not sure why the love was lost. I ran before I drank..Maybe I should return to it. p.s. I am doing well. Well, look at that! I loved that I learned something about you 🙂 A distance runner! And sounds like you still got it. Would you try to go at it again? Just for fun? not racing per se, but just to get the legs back on the pavement? I am excited to hear either way! Glad you’re well and I look forward in hearing more from you about this! Way to go Paul! Do you have any idea how many people would love to have your finish time? Add another hour to your time and that would be me. So stop with the calling yourself slow, because you make everyone slower than you sound decrepit. :p like when Twiggy calls herself fat. Dear god what does that make me? So yeah we get in that comparison game, but never forget there are those out there comparing theirselves to you. All the head games, the doubt, the crowds….yes! You did it. You are a rockstar. Though I am kicking you out of the turtle club. Use this time to celebrate and relish in your success. Don’t be in such a hurry to dismiss and move on. What you accomplished is huge. Bask in it. Enjoy it. Run for the joy of it. Hey Christy – thanks for responding! I am shopping for a coach now. Gonna try to improve! Meeting a goal sure is nice, but sometimes having no goal is even nicer. Enjoy those upcoming shoes-only runs. They’re the best! Thanks 🙂 basking, lol, yes it’s nice. Nicest really though to “share” my mom with others. Makes me happy. Have a good recovery Paul! I know I said this, but dammit, I’m saying it again anyway. So unbelievably proud to “know” you, and for realsies, you inspire me! Also, completely awesome podcast, I listened to it yesterday! You inspire me just as much, my friend. Can’t imagine not knowing you! And thanks for listening to podcast…Chris and Jeff are great guys. Congratulations, Paul!! As you outlined your emotions and thoughts, it felt like I was running right there with you. The roller coaster is amazing isn’t it? You captured it all so perfectly and my eyes welled right up with understanding. It makes me long to do another one, this time with a better attitude! Interestingly enough, my attitude was better on my first marathon when I ran it a good 30 minutes slower than my second. You have reminded me why people put themselves through the pain and agony. Thank you for sharing…I feel so bad that I almost missed it! I would have been twitter bombing you had I realized! I certainly learned a lot about things on this one. Mentally, it’s brutal. Mental toughness is not one of my fortes, to be honest. I am an easy giver-upper, but this was good to break through, as I was able to get past the negative self-talk and actually pull through. I can use this when my mind tends to want to drag me into something easier and softer. Thanks for being here, Michelle – so glad you made it here! I like your running posts! 🙂 They are written very well: engaging, moving, funny, interesting… and you managed to tweet during a run! 🙂 Score! Thanks Pheonix…I had time to tweet that once because I was down and out for a short spell! My wife thought it means 2 minutes as opposed to 2 miles as she panicked to get into the line up at the end! lol. Thanks for the kind words and for being here! Sorry to hear of your dads cancer… prayers! I hear ya on the 2 miles. I started with the couch-to-5K program where I would run a minute, then walk a minute and a half, etc. for 15 min. then that was it. I slowly built that up over a few months. I was envious of those who could run 2-3 miles in one go! But doing it every day like you is fantastic. Consistency like that is not in my vocabulary! Congrats for that! And your motto is something I am understanding more and more. I am already coach shopping so that I can improve myself! 4:52:30 the first time out and only recently picked up competitive running? Poor dear. Let me get out the worlds smallest violin. Congratulations, and thanks, you gave me a fair bit to think over…. I can totally relate to that “drinking to cover up being a screw-up”. I think that was half the reason I ever drank… It’d give me an excuse too, if I did/said something dumb. You know what though? When I’m sober I do less dumb stuff, and when I do I know it’s me, and I’m learning to accept that. It’s better the alternative (I drunk too much AND I’m dumb). Maybe I will start running, a marathon has always been on my bucket list but I’ve never run more than very very occasionally. Running is great – glad I took it up! Running is a form of meditation. You can clearing see that in your self dialogue, as with meditation it is staying the moment, recognizing the voices but letting them pass. I know nothing of running, expect running away. Which is not what you are doing here. You I believe have come face to face with who you were to who you are, and who you wish to become. Congratulations a job well done. Hi Jeff – you are right. I have referred to running as my moving meditation. Helps when I actually turn off the headphones when I do it though! I love University Ave., what a great road for a run. Well done, a magnificent effort of training and perseverance! Not mere coincidence you meeting the two people–but Jungian synchronicity. Wow Paul. Congratulation on your first marathon. My hat’s off to you. I run a bit, almost daily (at least during the weekdays), but it’s not my forte. I could never do a marathon. –This one here I can imagine very well. My daughter really likes play-doh and does this often. I’m rootin for ya Paul. I want to see you in Boston. Anyway, thanks for being you – spectacular you! Thanks for being you too Paul. You’re the spectacular one. p.s. btw, so sorry to hear about the horrible event there on Parliament Hill. I used to work just a few streets over from there when I lived in Ottawa. Nice read paul. I say I have no hobbies; I collect second careers. 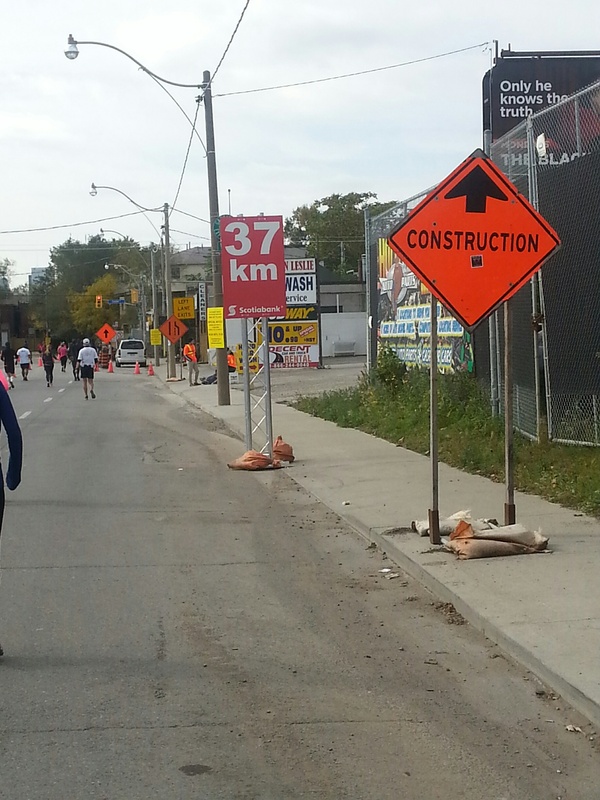 I ran for health early in my sobriety and then I trained for and ran two marathons – Ottawa and Toronto. That was 20 years ago and the only thing that has toned down my progressing to triathlons was an HIV diagnosis whereby my doctor urged me to take it easy. Why couldn’t I just run for pleasure? It’s hard now to stay at it because I don’t have a frightening goal ahead of me. I was playing guitar, it relaxed me and then compulsively learned everything I could about songwriting, wrote dozens and dozens, recorded five, got so enmeshed in the indie music scene that for 10 years I’ve hosted a radio show every week devoted to other indie artists. It has crushing demands on my time and energy but it’s hard to do anything – healthy or otherwise, with balance. Maybe I am better at it, a decade in, but I still have a day job and of course, my recovery to manage and I have more unfinished projects than I want to admit. You’re a great writer Paul. thanks for sharing; I identified quite a bit. Hey Joe! Oh my, I was reading your response and thought – wow, I am like that in so many ways…when I get into something, I GET INTO something. And wow, you even upped the ante on how I go about it! I can relate to not running for pleasure – I need a goal. Same as I can’t pleasure skate. I need a puck, a team and a goalie to beat. And it has to be a battle to the DEATH…ha ha. I do have my pleasure runs – like the one I had yesterday. But on the flip side, I am already getting a coach and already am planning NEW GOALS. (Sorry for all the caps in this response, just one of those days). Balance – oy vey. I have written about it many times and it’s a struggle today, in general, to keep that perspective and practice of just being able to do something for no other reason than its intrinsic value as opposed to a means to an end. Tough. You have an interesting CV…ha ha. Glad we crossed paths, kind sir. Awesome achievement Paul. Congratulations. I too am proud of what you have accomplished. I wish your Dad the best and hope he gets well. As a cancer survivor, I know some of the trials he faces. He will need your strength. Love it all, Paul. Such a well done narrative. PROUD of you! Love the opening goals (stay alive!) and moving (literally and otherwise) tribute to dad. You replayed what we all do on our own journey. If we compare ourselves to others, we’ll RuN the pendulum swing between the judging and the envy. A victory you won in your perseverance – not only for yourself but for your dad and us. Thank you, Diana. I am glad that you had a chance to read it and find something in there that transcends a simple run. I do have that tendency to compare (dreadful habit of mine) and you are right – it drags me here and there and everywhere and end up a muddy mess. Congratulations! I have so much admiration for you- it’s not just that you ran the marathon, it’s all the training beforehand to get you in there in the first place. You don’t run a marathon in under 5 hours without commitment and a huge amount of inner strength. You’ve buckets of both Paul. As I read through this, the comment that stood out the most was ‘I chose to stay connected.’ That’s a great attitude. Keep connected. P.S Love the new look of your site! PAUL!!! Congratulations! Running that distance and finishing in one piece is damn admirable! I seem to come back to your blog in key moments haha. Seriously, 42k is a big deal!!! I loved the post because I laughed so hard at the beginning but ended it knowing how wise you are. Oh the comparing, we all do it, I am glad I am not the only one haha. I nominated you for a Liebster award on my blog, so if you want to, you can participate! Sending you lots of love and peace, dear friend. I’m very late in congratulating you so congratulations! What an amazing experience! Sometime a run is a run and sometimes it’s so much more. I’m sorry for what your dad is facing, too. Blessings to you both! I am even later in getting back to you, Karen! Thanks for the kind words!! WOW! What can I say, you did it. A huge congratulations and I tip my hat to you. A marathon is no easy task. And I feel a bit bad for not posting sooner. I have your blogspot bookmarked now, I look forward to many other blogs. 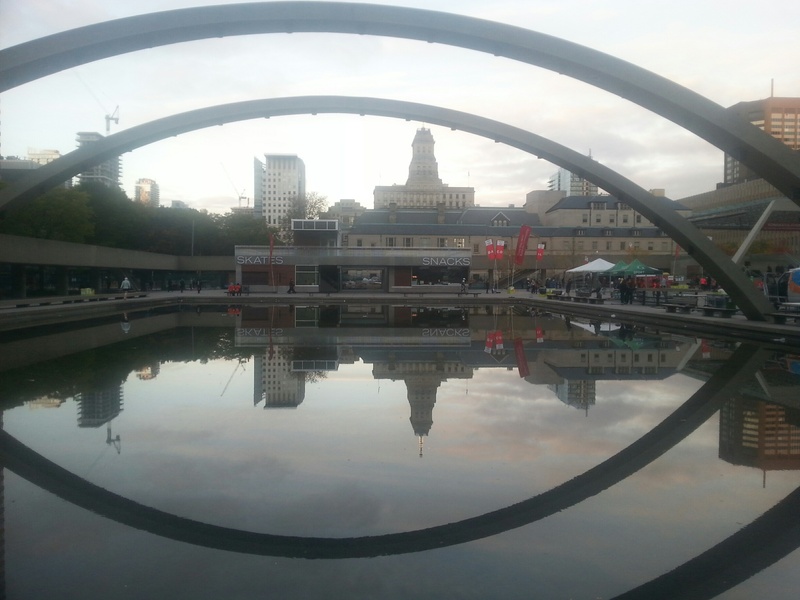 I actually wrote my first ever blog for my employer about #stwm, with the intent to inspire others. I wasn’t looking for a thank you, or a pat on the back, but I got all of it, but all I was just hoping for peeps would be able to take something from it. If you would like to read it, I would have no problems passing it along. Maybe we can tackle ATB in 2015, happy training, and happy thoughts. I hope all is well with you and your dad. Hi Craig – sorry about the delay in getting back to you!! I am glad to see ya here, my friend. And yes – I am doing ATB in 2015 – you gonna be there? Gotta meet up for sure then! Thanks for the kind words and for being here. Means a lot! GREAT post!!!! I hope I can be as raw and honest when I finally get around to running mine. Very inspiring! Hi Jen! So great to have you here!